The CNX-Times Now survey received criticism that the survey may not have been done taking the Mahakutami as one entity. The CNX-Times Now opinion poll has predicted that the Telangana Rashtra Samithi (TRS) will return to power for a second term in the state, in the upcoming Legislative Assembly elections scheduled for December 7. According to the poll, the TRS is predicted to win 70 seats out of the 119-member Assembly, compared to 31 by the Congress and 2 by the TDP. The poll predicted that the AIMIM would win 8 seats and said that the BJP is expected to bag 3, leaving other parties with 5. It also predicted that the TRS' vote share would increase to 37.55 from 34.30 in 2014, while the Congress is expected to get 27.98 compared to 25.20 in the previous elections.. 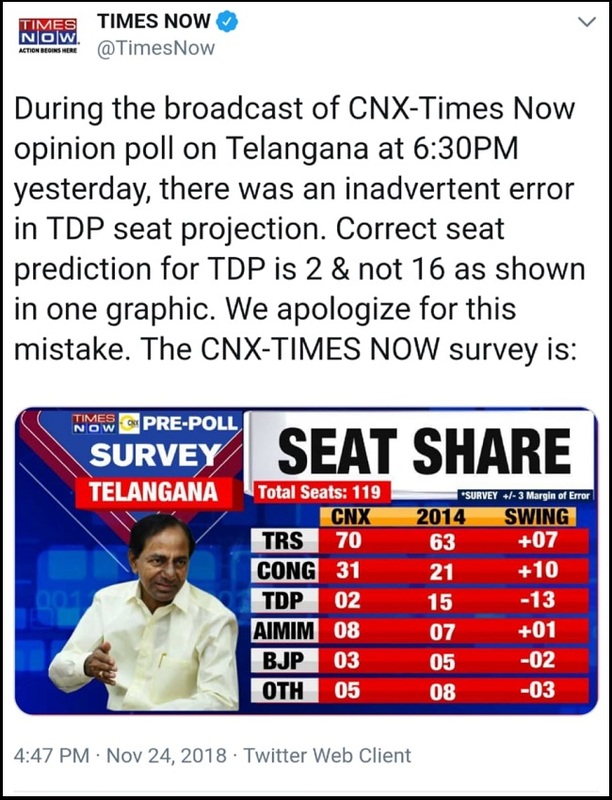 However, while the survey was being broadcasted on the channel, Times Now inadvertently displayed the poll's findings, giving the TDP 16 seats. Taking to Twitter later to issue a clarification, the news outlet said, "During the broadcast of CNX-Times Now opinion poll on Telangana at 6:30 pm yesterday, there was an inadvertent error in TDP seat projection. Correct seat prediction for TDP is 2 and not 16 as shown in one graphic. We apologize for this mistake." The CNX-Times Now poll results are however starkly different from the poll done earlier this month by Centre for Voting Opinion & Trends in Election Research, or CVoter, which predicted that the Congress-TDP alliance dubbed 'Mahakutami' would defeat the ruling TRS. The survey, which was conducted for ABP News and Republic TV, predicted that the TRS would only win a dismal 42 seats, while the Mahakutami, which also includes the Telangana Jana Samithi (TJS) and CPI, would bag 64. CVoter said that the Mahakutami was expected to grab around 33.9 percent of the vote share, compared to 29.4 percent predicted for the TRS. However, the same survey said that caretaker Chief Minister K Chandrasekhar Rao continued to be the top contender for his post, with 42.9 percent of those polled choosing him. The CNX-Times Now survey received criticism from pollster and CVoter's Yashwant Deshmukh who said that the survey may not have been done taking the Mahakutami as one entity. "That would make all the difference in the calculations for vote and seats projections, both," he tweeted. "There are two possibilities for TimesNow survey on Telangana. First: they have not treated Congress and TDP as an alliance. If taken together, projected vote share for Congress+TDP would be at par with TRS vote share. Don't forget to add votes of 2 more alliance parties," Deshmukh said. He also pointed out that the the survey projected about 5.6% votes for the TDP, but did not take into account that they were contesting only 13 or 14 seats, which would mean that their vote share in each of those individual seats would be around 51.3%. "With total 51.3% votes in the 13 seats that TDP is contesting, there is no way they would end up with just 2 seats and lose the remaining 11 seats. So, either the projected TDP vote share is wrong, OR their projected seat share us wrong. This is just not adding up," Deshmukh said. Are you getting the problem now? With total 51.3% votes in the 13 seats that TDP is contesting, there is no way they would end up with just 2 seats and losing the remaining 11 seats. So, either the projected TDP vote share is wrong, OR their projected seat share us wrong. This is just not adding up. IMHO. Times Now had earlier explained the methodology used while conducting the survey as it broke down the vote share percentage for each party.